The hospital required an application that could gather critical patient data through forms, compile the results daily, report those results to the patient’s healthcare team and alert the team in the event the results warranted intervention. 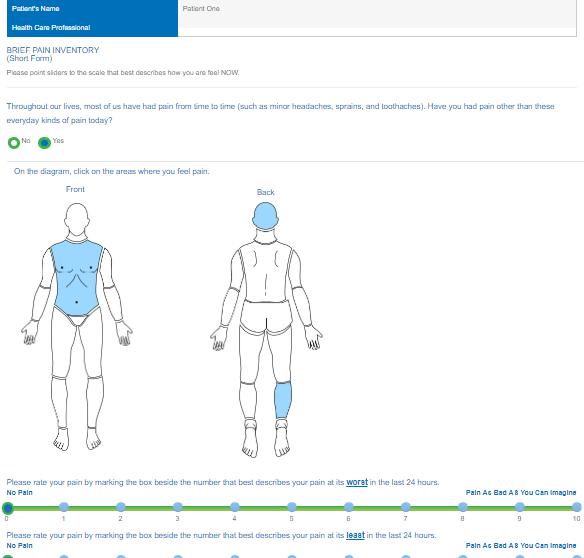 The application had to be accessible to all participants, easy to use and mimic the existing paper-based data collection mechanism the palliative care team employed. The hospital staff required administrative logins to create users and monitor the entered data in a simple-to-use and uncluttered dashboard. Doctors and nurses should be able to determine who has symptoms which require immediate attention, and be able to view the discrete data if required. At Nextide, we look at Drupal as a platform to build applications and not purely as a feature-rich content management system for websites. We were confident that Drupal was the right selection for the application. 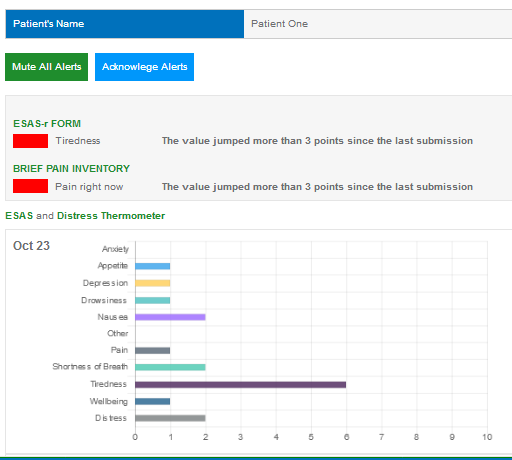 Through careful design, our team was able to create an interactive application that gathered patient data, compiled and weighted the results based on current and historical data, and send the palliative care team notifications when warranted. The image above shows two versions of the palliative care user’s home page. The left side is the home page when they are able to complete their daily forms. On the right, if the user completed their forms within the last 24 hours, they’re locked out of completing a new set of forms until the 24 hour window has passed. 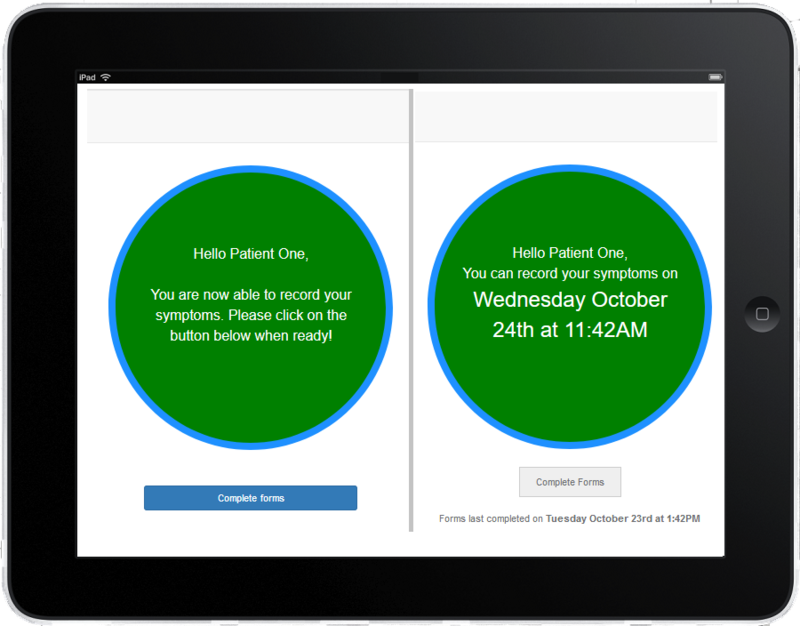 On any device the patient or caregiver has, patient data can recorded using Drupal to store all form data in custom entities. Themed form buttons and select lists are presented in easy-to-use clickable human bodies, sliders and radio buttons. Upon completion of the patient information forms, the results are compiled according to the hospital’s predefined requirements. The three forms have at least 50 discrete data points in total. We take the data entered, compare it to the last three to five days of the patient’s data and determine trends within those fields which require an alert being triggered. If a user is deemed to be “alerting”, we send a notification to the healthcare team and flag the user and the fields as alerting. When a healthcare user enters the system, their homepage is comprised of a simple to use dashboard. 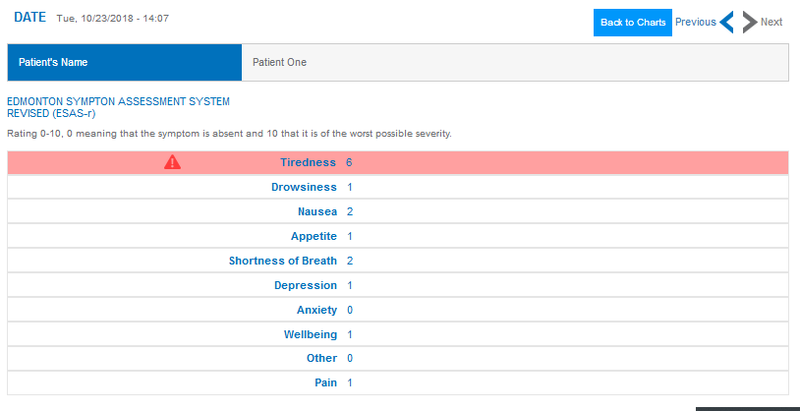 The dashboard presents the user with an easy-to-read listing of patients with their status plainly visible. The healthcare user is able to drill into any patient’s data, giving them a graphical breakdown of the historical patient data. The nurse or doctor is able to see the trends in the patient data and is able to take appropriate action. Healthcare users are able to acknowledge the alerts, thereby clearing the status of the patient, and they’re able to silence alarms for any given patient so they do not receive alerts for 24, 48 or 72 hours. We generate on-the-fly graphs of patient data. Healthcare professionals can also drill even further into each entity where they’re able to view each form’s entry and mute any alerting fields. Themed Drupal entities give the healthcare professional a quick breakdown of patient entered values. If a field is alerting, it’s highlighted and gives the user the option to silence the alarm by clicking on the alerting symbol. Users are able to scan back and forth through daily entries. The interface is easy to use, uncluttered and responsive in design. 105 critical alerts were generated by the system and sent to the patients’ circle of care. 46 of the 105 critical alerting patients received follow-up intervention. 7 patients who had not triggered an alert received telephone intervention after the healthcare staff noticed trends in their data. Saved an estimated $62 000. That’s right! This single application over the course of three months saved over sixty-thousand dollars in unnecessary care in the Emergency Room! Every time a patient receives proactive care, the likelihood that they require an Emergency Room visit is reduced, thereby reducing the load on the hospital. When you consider the small pilot size and the number of interventions required, each intervention could have eliminated a potential Emergency Room visit. A resounding success! When you look at Drupal as “just a content management system”, you lose sight of what it really is: a platform to produce applications that matter. At Nextide, we have been focused on Drupal since 2009. Our experience in Drupal ensures that we utilize the most effective modules to construct sites and applications that are optimized for performance and functionality. We continue to leverage Drupal in many more ways than just content management. Our core strengths are focused on the design and build of creative sites, and web based business applications, that mirror the way people think and work. We can custom create any business function or create the ideal work environment for people to perform at their best. The capability to deliver robust custom applications to our customers allows us to deliver solutions from healthcare, to HR, and everything in-between. Do you have a Healthcare initiative we can help with?